Spring is on the horizon so it’s time to be on the look out for those end of the winter season sales. For instance, I recently grabbed a few pairs of winter gloves for pennies at my local Walmart. 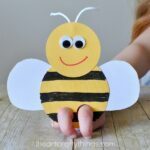 A few days ago my daughter and I turned them into these cute butterfly finger puppets, perfect for a fun spring kids craft. My daughter even made a couple and handed them out as gifts to some of her kindergarten friends at school. 1. 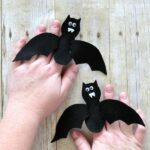 Begin by cutting the finger off of your gloves. You can discard the remaining part of the glove, or my daughter likes to hold on to them and keep them with her dress up clothes for play. 2. 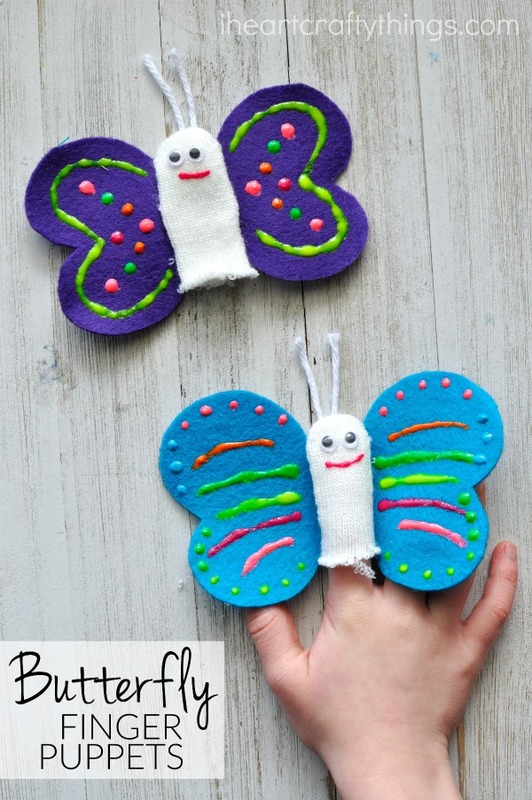 Use the butterfly finger puppet pattern and a black marker (or pen) to trace the butterfly wings pattern onto a piece of felt. Cut it out. 3. Heat up your hot glue gun. 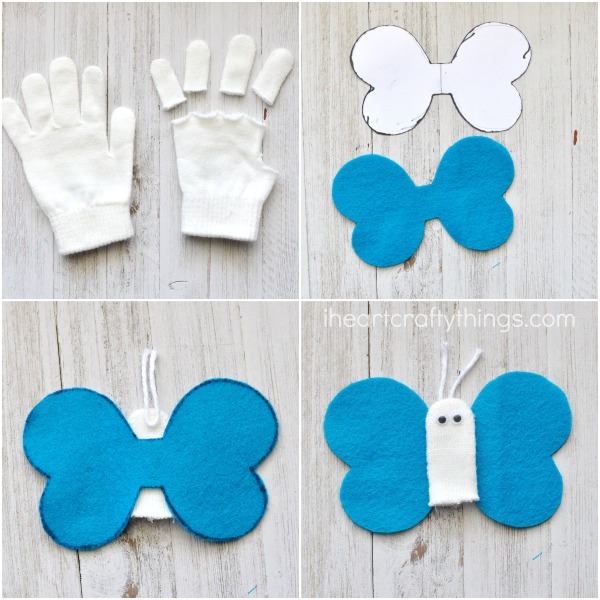 Glue the butterfly wings onto the back of one of your glove fingers. Then cut off a piece of white string for antennae and glue it to the back of the glove finger. 4. 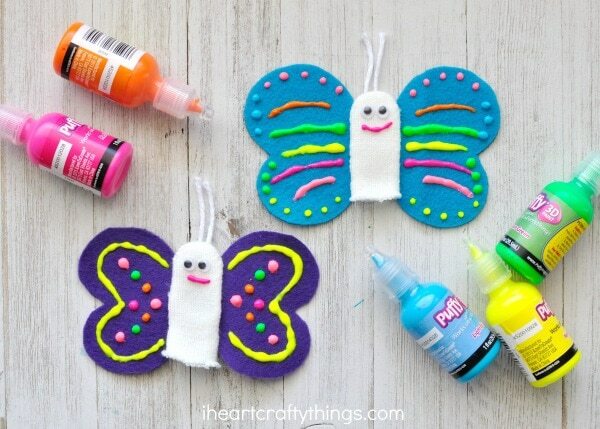 Glue googly eyes onto your butterfly finger puppets. 5. 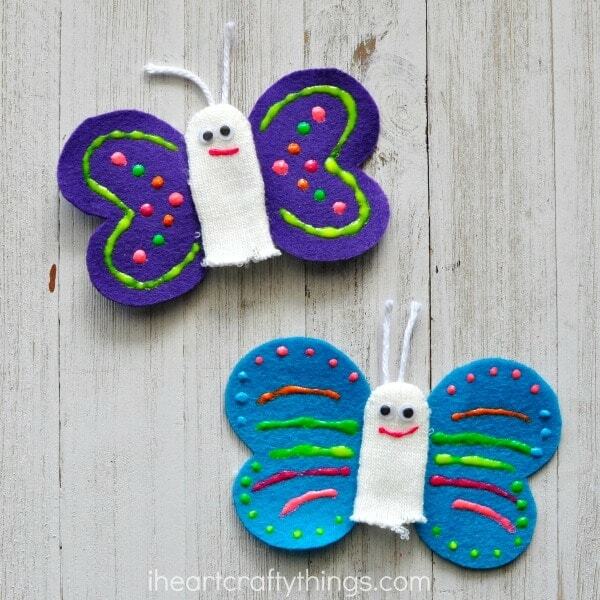 Finish your cute butterfly finger puppets by using your puffy paint to decorate the felt wings of your butterfly. 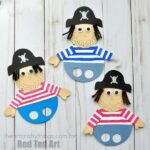 When you are finished allow the puffy paint to dry completely. When the glue is dry your butterflies are all ready for play. 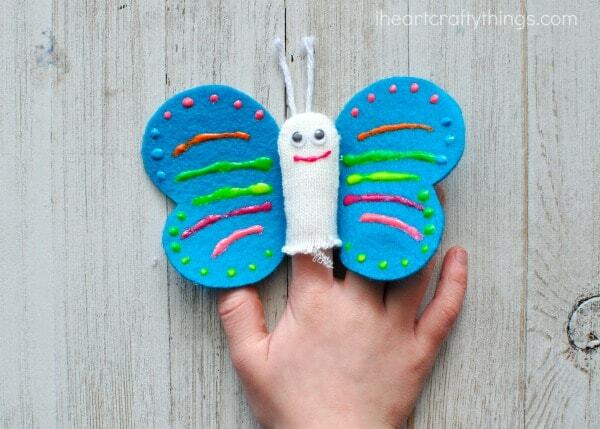 Simply place your finger into the hole and fly your butterfly finger puppets all around the house.